Most camping brochures feature a picture of adults and kids sitting around a campfire toasting marshmallows and telling stories. But, a campfire requires following safety guidelines if campers are to be safe and the campground protected against fire. The following campfire safety tips are from Idaho Firewise. Most campgrounds already have preexisting fire rings to use. Unless the fire ring is in a dangerous spot, you should build your fire there. The campground owners have likely already deemed this as a safe location to build a campfire. The fire ring will help contain sparks and prevent your fire from spreading. 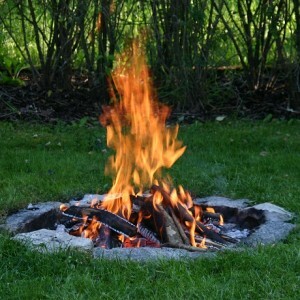 If your campsite does have a fire ring already, check if it meets the above criteria too. The landscape around your campsite could have changed since the fire ring was initially built. There might now be a branch that overhangs the current fire ring. For example, now there might be branches overhanging the old fire ring. Once you have chosen where to build your campfire, you need to ensure the area is completely clear of any combustible material that could possibly ignite. It is best to clear the ground right down to the soil, and out five (5) feet from the fire pit. Fires can spread underground through root systems or decaying material. Surrounding twigs and dry leaves can easily catch fire from a wayward spark. After the ground has been cleared, dig a shallow pit about two (2) feet across and encircle this pit with a ring of medium-sized rocks. These rocks should be tightly placed together, without any gaps where sparks could fly through. Remove any small, loose stones from the pit that could potentially explode from the fire’s heat. Before you begin building the campfire, make sure you have equipment on hand to extinguish a fire. A responsible camper will not light the first match until he or she is sure there is a bucket of water or sand nearby to douse unruly flames in the event of an emergency. You will need a large bucket of water and a shovel. Keep these things close enough to the fire pit that they are quickly accessible in an emergency. Avoid using lighter fluid, or any other chemicals, to start your fire. These fuels are dangerous to use in the wilderness. They can unexpectedly flare-up and catch your clothing on fire. Always use a lighter or match to ignite the kindling. Do not discard any used matches until they are cool to the touch. While your campfire is burning, never leave it unattended. Despite safety precautions, the campfire could spread from your fire pit. You need to remain in the area to ensure your campfire doesn’t spread. Be careful what you burn in a campfire. Try to stick to manageable pieces of firewood that easily fit within your fire pit. It is not a good idea to burn large logs that stick out past the fire pit. Also, avoid burning fresh branches that give off excess sparks. Before you go to sleep, or when you leave the campsite, you must fully extinguish your campfire. First, douse the flames by pouring water on the fire. However, you are not done yet. Just because you can’t see flames, does not mean the fire cannot re-ignite. Hot embers will continue smoldering for hours. To deal with the embers, stir the coals and add more water. Then cover the coals with dirt or sand. Feel the ashes with your hand to make sure there are no hot coals left. It is far too easy for a campfire to spread and become a forest fire. When you are camping, it is your responsibility to protect the forest from your campfire. Follow these simple campfire safety rules and use common sense. Sometimes, it simply is not safe to have a campfire at all.